The Enterprise Server Release Notes contain information about the new features, changes, fixed issues, known issues and upgrade instructions for each release of Enterprise Server version 9. The Workflow status for a layout or Layout Module can now be set to skip InDesign Server Automation. This is done by setting the 'Skip InDesign Server Automation' option for that Workflow Status. For more information, see Setting up InDesign Server Automation in Enterprise Server 9, section 6 'Configure when the InDesign Server Automation should not be triggered'. Based on certain conditions you can skip the creation of an InDesign Server job. The plug-in is named 'InDesignServerJobDemo' can be downloaded from WoodWing Labs. Use it as a starting point for your own plug-in. All instances of 'Adobe DPS (2015)' have been renamed to 'Adobe AEM'. EN-21073	Display names of metadata are not respected when defined on All/All/All level with custom property on Brand level. EN-84108	Previews are not generated by ImageMagick with EPS and PSD. EN-86710	UNC/DFS Health Check test shows Error although Enterprise can access the file store. EN-86861	Access denied (S1002) error when trying to create a Dossier in Personal status. EN-86904	When creating a new recurring custom Server job through jobindex.php an error is raised in the log file. EN-86913	Display name for Route To not working correctly for QueryObjects. EN-86918	Preview for InDesign Server shows incorrect linebreak/overset calculation with specific pragraph style settings. EN-86925	[IDS Automation] Update available message is not displayed for modified article in Publication preview. EN-87015	Too many InDesign Server jobs are created by InDesign Server Automation when simultaneously checking-in placed articles and the layout. EN-87051	Improvements for integration with Automated Print workflow and other integrations like MadeToPrint. EN-87071	Changed metadata display name not reflected in all areas. EN-87073	Captions and Credits are not updated when performing a Place Image action in Content Station with Smart Image enabled. EN-87074	Duplicate DB id's possible because of wwtest. EN-87107	Make script name to be run by InDesign Server Automation configurable via setting or function call. EN-87142	InDesign Server Automation removes comment set on a layout. EN-87146	InDesign Server Automation job is created for layout not in Production/Completed phase. EN-87149	Custom Server plug-in connector that wants to do auto naming is ignored for Dossiers and Layouts. EN-87174	MultiSetProperties does not set 'route-to' field in smart_log. EN-87192	Rename Adobe DPS (2015) to Adobe AEM. EN-87207	InDesign Server Automation - admin user cannot exclude layout statuses in workflow setup. EN-87213	Deadlocks occur, potentially causing data loss. EN-87218	InDesign Server Automation - Let custom server plug-ins have a last say about job creation. EN-87314	Enterprise System ID is reset when database upgrade takes place. EN-36871	Elvis images are removed from the layout if a user without access to Elvis checks-in the layout. EN-83923	Download PDF does not work when using Safari. EN-85926	Image metadata values are added to article metadata when image is part of the article. EN-86683	Searching with Solr should give results in 'best match first' order when no sorting is applied from client. EN-86908	Layout preview not shown when layout name contains ampersand. EN-87110	"Show Dossiers" is unusable because of long response time. Clean installation. For information about installing Enterprise Server on a system on which Enterprise Server is not yet installed, see Enterprise Server 9 full installation. When running PHP 5.3, upgrade to PHP 5.4 or 5.5. Upgrade to ionCube Loader 4.6.1. See Installing ionCube for use in Enterprise Server 9. Upgrade your Twitter Publishing Connector in Enterprise to the latest version. EN-87153 Too many InDesign Server Jobs are created by InDesign Server automation when simultaneously checking-in layout and its placed articles. No new features have been introduced in Enterprise Server 9.8.1 build 252. Support for Drupal 6 is now restricted to the Enterprise Server Maintenance version 9.4.x. Support in higher versions of Enterprise Server for Drupal 6 has been dropped. Drupal 8 is now fully supported (previous support related to the beta version of Drupal 8 only). EN-86443	Warning observed in the error log when no users are assigned in a group. EN-86781	Extend Health Check for Oracle extensions. EN-86598	Warning in Server logging when editing shadow image from Content Station. EN-86902	Track Change in article results in line-break on Drupal 7. EN-35298	nlNL.xml spelling incorrect 'verwijdert' instead of 'verwijderd'. EN-86513	Dossier is created with same name even after same name message. EN-86594	Drupal 8 : Error when importing templates. EN-86673	Web Server freezes if database is down and idsjobindex.php is called. EN-86923	Suggestions are not stored in Drupal 8. EN-86576	Incorrect ordering of Publish Form fields. The Automated Print Workflow feature makes it possible for Content Station users to place articles and images on a layout as well as crop images. Editors can immediately edit a story in the context of the page. The number of steps (touch points) in the workflow is reduced. The designer can focus on designing the layout instead of having to place articles. Less InDesign installations are needed. Note: The Automated Print Workflow is especially useful for publishers of news papers and for publishers of magazines with a template based workflow. Placing content of a Dossier obviously requires a Dossier-based workflow and is therefore not (or less) applicable to publishers of glossy magazines and not applicable to publications that do not make use of a Dossier-based workflow. Articles can only be placed in frames that are grouped together in an InDesign Article and that have the correct Element Label assigned. Step 1. Select all frames on the layout that belong to the same article. Step 2. Access the Articles panel (Window > Articles). Step 3. Drag the frames onto the Articles panel or click the + button in the panel. Step 4. Assign Element Labels to each frame or — when these have already been assigned — make sure that the correct labels have been assigned. Each frame should have the label assigned that corresponds to the content that it is going to hold, such as 'head', 'intro', 'body' and so on. For more information, see Working with Element Labels in Smart Connection. Articles and images need to be assigned to the same Issue and Edition. Images can only be automatically placed when only one image is present in the Dossier. When multiple images exist, no images are placed. 1 Enabling this plug-in is not required but is recommended. When not enabled, all background tasks will be queued which will result in longer processing time when the layout is opened or when previews are generated. Support for Oracle 12 has been added. No changes have been implemented in Enterprise Server 9.8.0 build 239. No changes to the documentation have been made for Enterprise Server 9.8.0 build 239. EN-85894	Avoid side effects of alien object IDs. EN-86546	Placed On column shows "Multiple Objects" for Dossiers. EN-86609	InDesign Server does not show preview of layout name containing accented character. EN-86629	Sorting not working for "Placed On" and "Placed On Page" columns when using SOLR. EN-86662	Search criteria change when InDesign Server Jobs page refreshes on auto-refresh. For information about installing Enterprise Server on a system on which Enterprise Server is not yet installed, see Enterprise Server 9 full installation. Note: Important changes were introduced in Enterprise Server 9.7.0. If you are upgrading from a version that is older than 9.7.0, please review these changes to see if they affect your Enterprise Server environment. For information about upgrading an existing installation of Enterprise Server, see Enterprise Server 9 minor upgrade. Note: This feature is an integration of the SGLPlus Server plug-in which is available for previous versions of Enterprise Server on WoodWing Labs. When Content Station or InCopy users need a new update of a layout (for example to verify the changes that they have made to an article that is placed on the layout), the layout needs to be opened and saved in InDesign. Generating the files takes a long time and InDesign users have to wait for the process to complete before they can continue working. The InDesign Server Automation feature makes it possible to offload the tasks of generating these files to InDesign Server. As a result, the waiting times for InDesign users is reduced and InCopy and Content Station users will have an updated layout preview available shortly after the edited file is saved. This functionality is provided by an Enterprise Server plug-in. For information about setting up InDesign Server Automation, see Setting up InDesign Server Automation in Enterprise Server 9. Traditionally, the Adobe property 'Kicker' (used for displaying the section title of a magazine, such as Reviews, Features, or Editorial in the scrubber and in the Browse mode), was fed by values from the default Enterprise field 'slugline'. Because users had to manually enter the values, these values were open to errors and inconsistencies. Enterprise Server 9.7 introduces the use of a custom metadata field of type 'list'. This way, users can select from a pre-filled list of values, thereby ensuring accuracy and consistency. For more information, see Integrating Adobe DPS in Enterprise Server 9. Important: When already using the slugline field, upgrade steps are required. See Upgrade below. Support for PHP 5.6 has been added. Support for SQL Driver version 3.2 for PHP 5.6 has been added. Support for ionCube Loader 5.0.14 has been added. Support for PHP 5.4 has been dropped for Windows and Mac OS X, but is still supported on Linux. Support for ionCube Loader 4.6.1 has been dropped. The ZendFramework that is shipped with Enterprise Server has been updated from version 1.11.12 to version 1.12.16. Database tables and PHP classes have changed. Any custom InDesign Server Jobs therefore need to be updated. See the Upgrade section below. The Enterprise logo as it appears in the Web pages has been updated. Figure: The old logo for Enterprise (left) has been replaced by a new logo. Failed to load external entity "https://<Server url>/index.php?wsdl"
These errors are caused by changes introduced in PHP 5.6 and are incorrectly displayed; they can be ignored. EN-8243	Dialog Setup does not accept order number higher than 127. EN-32106	[DPS] Add new custom field named Kicker. EN-33745	Article loses Issue link after detaching it from the layout. EN-36879	Do not use localhost on Windows for database connections. EN-85853	Errors are displayed in Server logs when running the InDesign Server Jobs page. EN-85874	Add data definition statements to the dbdrivers. EN-85929	Remove out-of-date checks during database upgrade/installation. EN-85951	When client calls SendToNext service, the MultiSetObjectProperties server plug-in connectors are called twice. EN-86296	Upgrading does not run DB script to add CC 2014 support for InDesign Server. EN-86339	New custom property named Kicker for Adobe DPS. EN-86471	Uploaded images get incorrect DPI value. Due to changes in the Enterprise 9.7 database tables and PHP classes, any custom implementations of InDesign Server jobs need to be updated. When your Server plug-in or Web application calls any of the PHP classes below, please study the impact and migrate your code accordingly. The parameters of most functions have changed and some functions are removed (and many are added). Functions now use data classes (PHP objects) instead of DB rows (arrays of records). Functions now throw a BizException on error instead of returning error codes. Callers should use try-catch blocks. SQL has been moved from the apps and biz classes into the DB classes. Functions are moved to let classes take their own responsibilities. Instead of calling BizInDesignServerJobs::startBackgroundJobs(), periodically run idsjobindex.php with help of crontab/scheduler. The whole class has been removed. The InDesignServer::GenerateOutputPages() function has moved to BizWebEditWorkspace::generateOutputPages(). The InDesignServer::runScript() function has moved to BizInDesignServerJobs::createAndRunJob() and params have changed. The InDesignServer::getCurlPath() has moved to BizInDesignServerDispatcher::getCurlPath(). The whole module has been removed. Instead of running this module from workflow operations in PHP, periodically run idsjobindex.php with help of crontab/scheduler. New data class, to be used instead of DB rows. When your customization queries the jobs table, please study the impact below and migrate your SQL statements accordingly. Unique identifier (GUID) of the job record. Whether or not end-users are waiting for the job to complete. Background jobs are offloaded from the workflow. objid (int) The object ID of the Layout or Layout Module that to be processed by the job. Major object version of Layout or Layout Module that is processed. Populated once the job is picked up from the queue. Minor object version of Layout or Layout Module that is processed. Populated once the job is picked up from the queue. Unique name of this kind of job. Used to configure priorities (JobPrio). locktoken (varchar(40)) Added. GUID generated by a PHP process to assure it took the lock to execute the job (blocking other processes accidentally running the same job at the same time). queuetime (varchar(20)) Time when the job was pushed into the queue. Format: yyyy-mm-ddThh:mm:ss. starttime (varchar(30)) Time when the job was picked from the queue. Format: yyyy-mm-ddThh:mm:ss. readytime (varchar(20)) Time when the job execution was completed. Format: yyyy-mm-ddThh:mm:ss. jobstatus (int) Added. Current status of the job. Combined field: the values of jobcondition and jobprogress are added. See InDesignServerJobStatus.class.php for details. jobcondition (int) Added. Healthiness of the job execution; 4096=Info, 8192=Warning, 16384=Error. jobprogress (int) Added. Progress of the job execution; Todo=256, Busy=512, Done=1024. attempts (int) Added. When job is pushed into the queue, value is set to zero. After job execution this value is incremented by 1.
assignedserverid (int) The InDesign Server instance that is picked to handle the job. When the job is retried, it represents the last picked one. minservermajorversion (mediumint) Minimum required internal major version of InDesign Server that is suitable to execute the job. 8=CS6, 10=CC2014, and so on. minserverminorversion (mediumint) Minimum required internal minor version of InDesign Server that is suitable to execute the job; See also minservermajorversion field. maxservermajorversion (mediumint) Maximum required internal major version of InDesign Server that is suitable to execute the job. 8=CS6, 10=CC2014, and so on. maxserverminorversion (mediumint) Maximum required internal minor version of InDesign Server that is suitable to execute the job; See also maxservermajorversion field. prio (mediumint) Priority used to select which InDesign Server instance should pick it up. ticketseal (varchar(40)) Added. Ticket that can be used by the job script to logon without a user name and password. ticket (varchar(40)) Added. Ticket of the job itself. It is set once the job script has logged in to Enterprise. actinguser (varchar(40)) Added. Short name of the user who has logged in through the InDesign Server job. initiator (varchar(40)) Added. Short name of the user who has pushed the InDesign Server job in the queue. servicename (varchar(32)) Added. Name of the Web service in which context the InDesign Server job was pushed into the queue. context (varchar(64)) Added. Additional information in which context the InDesign Server job was pushed into the queue. Free format, depends on the job type. In previous versions of Enterprise Server, the default slugline metadata property was renamed to 'Kicker' to match the 'Kicker' field in Adobe DPS. In Enterprise Server 9.7 a dedicated field is used, namely a custom metadata property of type 'list', named 'Kicker'. Click Yes when a fixed number of values was used for the Slugline field and these values need to be migrated to the new Kicker field. Click No when no fixed list of values was used for the Slugline field, thereby making it a 'free' field. In such scenarios migration is not very useful. After migration, the new custom property 'Kicker' will have been created for both scenarios. Add the values previously used in the 'Slugline' to the list of the Kicker custom property. For more details, see Integrating Adobe DPS in Enterprise Server 9. Remove the old 'kicker' field ('Slugline (Kicker)') for the object type Dossier. Add the new 'Kicker' field (* Kicker) for the object type Dossier. Step 2. On the Metadata Maintenance page, clear the display name of the Dynamic Property 'Slugline'. A check is done to see if the new Kicker field is present and filled. If so, it is used. When no new Kicker field is present, a check is done to see if the slugline is set and filled. If so, it is used. However, if you have added the new Kicker field to your dialog setup and have removed the old slugline field, you will not see this field in your Dossier properties. When running PHP 5.4, please upgrade to PHP 5.5 or 5.6. Upgrading the ionCube Loader can be done through the ionCube Loader Wizard page during the upgrade of Enterprise Server. For MSSQL databases: after upgrading to PHP 5.6, upgrade to SQL Driver 3.2. No new features have been introduced in Enterprise Server 9.6.1 build 208. No changes have been introduced in Enterprise Server 9.6.1 build 208. Compatibility of operating systems with Enterprise Server. Added a statement to also verify the compatibility of any software that is installed by the operating system. Enterprise Server 9.6.1 build 208 includes a fix for issue EN-36923 ' Wrong DPI value displayed for PSD images'. A limitation of the solution is that it only has effect when the 'ImageMagick Preview' plug-in is enabled. This plug-in is used to extract the correct DPI information from an image. EN-22697	'My Reporting' shows incorrect number of images/articles when placing them on layout of another Issue. EN-34973	Add check and tips on Health Test regarding use of UNC path with Adobe DPS/ InDesign Server. EN-36923	Wrong DPI value displayed for PSD images. EN-84889	Missing PNG files in Content Station folio export. EN-85029	Relation in smart_objectrelations table is not updated when an object is moved to Trash Can. EN-85390	InDesign Server errors too long for Oracle column. EN-85648	ImageMagick integration can be made twice as fast for processing JPEG images. EN-85660	Display Name for PlacedOnPage cannot be changed. EN-85743	When metadata "Name", display name is changed, Content Station upload fails: longer than max allowed length, must be less than 0. EN-86021	Wrong Publication shows up in the properties while uploading anything in a Dossier of an Overrule Brand issue. EN-86048	Compatibility Matrix: include info about verifying compatibility of applications installed by operating system. EN-86105	Export to PDF with large number of pages fails. EN-86258 Creating a new object fails in case 'ID' has a custom display name. EN-86257 Failed registration leads to blank page in Facebook registration page. EN-86256 Permission error during publishing to Facebook. EN-86254 Issues missing during Solr indexing. EN-86247 Enterprise 9.4.6 database upgrade script breaks planning integration by removing adverts from layouts. The following new features have been introduced in Enterprise Server 9.6.0 build 194. The functionality of uploading content from WoodWing Enterprise to the Adobe Digital Publishing Solution (Adobe DPS 2015) by using InDesign is provided through an Enterprise Server plug-in together with the use of Smart Connection plug-ins. //    E-mail address to use as the sender of the e-mail. //    page of the user who sent the e-mail is used instead. //    User name to use for the sender of the e-mail. //    the user who sent the e-mail is used instead. For more information, see Configuring e-mail notifications in Enterprise Server 9. When multiple InDesign Server Jobs enter the system, it makes sense to process some Jobs before others. When Enterprise Server Jobs enter the Server Job queue, they will stay there indefinitely. When the queue holds too many Jobs though, the performance of database queries can be negatively affected and the overview of Jobs in the Job Queue becomes difficult to manage. It is therefore important to clean up the queue on a regular basis.This could already be done manually and can now also be done automatically through the Enterprise Server Job named "AutoCleanServerJobs". For more information, see Deleting Enterprise Server Jobs from the queue in Enterprise Server 9. Depending on the configuration the payload can be send over by using 3rd-party software such as Aspera or BBCP and/or the SOAP communication can be zipped. Depending on the distance between the server and the remote office, network connection and protocol, the check-in/check-out process is up to 2–5 times faster. For more information, see Improving the performance of Smart Connection for InDesign for remote users. No changes have been implemented in Enterprise Server 9.6.0 build 194. The following documentation accompanies Enterprise Server 9.6.0 build 194. EN-36183	Create new version with ModifyLayouts when using the Planning Interface. EN-83865	Imported LDAP-groups should be displayed by their display name. EN-84403	Support for Malayalam Hunspell within Content Station Multi-Channel Text Editor. EN-84526	Slideshow for gallery in WordPress not working correctly. EN-84851	Running Health Check from outside the server leads to ionCube page instead of the Health Check page. EN-85188	E-mail notifications blocked by e-mail server due to sender. EN-85582	Unable to find Dossiers when using Solr search. No new features have been introduced in Enterprise Server 9.5.2 build 179. No changes have been implemented in Enterprise Server 9.5.2 build 179. No documentation changes have been made for Enterprise Server 9.5.2 build 179. EN-85458	No article previews shown in Multi-Channel Text Editor when layout name contains special (accented) characters, (incorrect) error Layout not saved is shown. EN-85459	Content Station Views corrupted when asset have no issue(s) assigned. Smart Connection views raise a SOAP error. EN-85460	Vulnerability of Enterprise Server from Maintenance page. EN-85461	Modify ContentStationOverruleCompatibility_WflLogOn to list only FeatureAccessList that belongs to the overruled Issue. EN-85462	Expose GetDialog->GetStatesResponse in the GetDialog2 connector. EN-85463	Migration from database v7 to v9 in MSSQL causes not up-to-date indexes in smart_channeldata table. EN-85464	Importing WordPress results in error - C_WORDPRESS_FEATURED_IMAGE_FILE is too long. EN-85465	Featured Image description is not reflected in WordPress. EN-85466	Errors in logs are generated when importing content type of WordPress. EN-85467	Objects in overruled Issue not visible for user without admin rights. EN-85468	Drupal form import in production database takes hours. EN-85469	Content Station changes image name when uploading into Dossier. EN-85470	Article preview results in error when one of the XMP blocks is not parse-able. EN-85471	WWTest script gives wrong information on the InDesign Server version compatibility. EN-85488	No article preview in Multi-Channel Text Editor with article from template. No changes have been implemented in Enterprise Server 9.5.1 build 154. EN-83923	Downloading PDF does not work using Content Station Web in Safari. EN-83983	Failure to delete assets from the Trash Can permanently (S1029). EN-84183	Use article name when creating PDF. EN-84430	MulticastGroup is missing in configserver.php. EN-84526	Slideshow for gallery in WordPress is not working correctly. EN-84630	Server crash if InDesign XMP cannot be read. EN-84692	Sticky notes: MessageList is not resolved for GetPagesResponse. EN-84841	Bad performance for logon containing many Access Rights, Brands, and Issues. EN-84918	Introduce server feature 'UpdateAllContentAfterOpenArticle' in configserver.php. EN-84961	[Preview] Layout is retrieved although it is not changed. EN-84962	Resizing or moving a Sticky Note changes it's modification date. EN-84964	Dossier created via the Create Image dialog in InDesign is not assigned to the Issue where image is created. EN-84965	Database errors with specific query on MySQL 5.5. EN-84971	Auto renewing licenses results in a warning in the server error log file. EN-85002	RouteTo property is cleared for multiple selected objects. EN-85004	Solr error when executing a search on 'Deleted On'. EN-85005	Logon fails on IPs with port numbers containing a colon ':'. EN-85007	AutoRoute does not work with "Send to" without showing "Route to" dialog. EN-85008	Error related to "SQL syntax" occurs when refreshing Publication Overview Application of Content Station. EN-85009	Trash Can in Content Station shows all users of a [shared] system. EN-85010	Custom metadata property with same name when removed from one Brand also removes it from other Brand. EN-85016	Number of placed images are not shown when deleting the Issue. EN-85017	Incorrect number of licenses are activated when entering '0' while activating more licenses. EN-83559 New updates of MadeToPrint integration are not working correctly because of missing MadeToPrintDispatcher::clearSentObject() call in Enterprise Server. For more information, see Improving the Multi-Channel Text Editor performance for Content Station 9 users on remote locations. The Enterprise Server plug-in for publishing to Twitter now makes it possible to include one or more images. For more information, see Publishing to Twitter with Content Station 9. Although still in beta phase, support for Drupal 8 has been added by making an Enterprise Server plug-in available which has been tested with Drupal 8 beta 3. Warning: We advice not to use beta versions of software in a production environment, use it at your own risk. For more information, see Integrating Drupal 8 in Enterprise Server 9. Note: Drupal 7 data created with Enterprise cannot be migrated to Drupal 8 at this moment. Support for PHP 5.3 has been dropped while support for PHP 5.5 has been added. PHP 5.4 is also still supported. Support for ionCube Loader 4.6.1 has been added. Support for ionCube Loader 4.2.2 has been dropped. The instructions on the ionCube Loader Wizard page have been improved and fine-tuned for Enterprise Server installations. Support for Smart Connection 9 and Smart Connection for Adobe CC has been dropped while support for Smart Connection for Adobe CC 2014 has been added. Smart Connection for Adobe CS6 is still supported. When no matching version is available, no preview is generated. Example: Enterprise Server 9.4 could pick InDesign Server CC for a layout created with InDesign CS6. Enterprise Server 9.5 picks InDesign Server CS6 (when available). The ionCube Loader test case is no longer listed on the Health Check page; when an incorrect version of the loader is installed, the ionCube Loader Wizard is shown (instead of the Health Check page). For more information, see Installing ionCube for use in Enterprise Server 9. When loading the Health Check page, you might first see progress bars of the ionCube Loader Wizard before the Health Check page itself is shown. Operating systems: same as Enterprise Server 9.4. See Compatibility of operating systems with Enterprise Server. PHP 5.5 and PHP 5.4. Support for PHP 5.3 has been dropped. Note: For Microsoft SQL Server, use PHP 5.4 (PHP 5.5 is not supported by Microsoft). ionCube Loader 4.6.1. Support for ionCube Loader 4.2.2 has been dropped. InDesign Server: Smart Connection for Adobe CS6 and Smart Connection for Adobe CC 2014. Support for Smart Connection 9 and for Smart Connection for Adobe CC has been dropped. EN-28503	Hunspell Language Definition does not conform to ISO Standards. EN-31841	The Web Editor Access right is no longer needed. EN-32776	Enterprise does not correctly use assigned Server version for InDesignServerJobs. EN-33253	Element Name property should not be available in Dynamic properties. EN-34271	Layout is not unassigned if parent Dossier has been unassigned of any Issue. EN-34404	Creating a Task in a Issue where a Task already exists with the same name appends suffix. EN-35147	All licenses are activated when Number of Concurrent Connections is set to zero. EN-35801	Content Station breaks article when a copy of itself is contained in the same Dossier. EN-35821	Deadline is not calculated as per the deadline of "Category" and "Status". EN-36040	Display name not shown for the custom property when Brand is selected instead of <All>. EN-36057	Phantom article created when creating an article with “New Dossier” using the same name as an existing Dossier. EN-36186	Layout with articles show text from another article because of duplicate guids issue. EN-36540	InDesign Server host name restricted to 27 characters. EN-83299	System admin user cannot access subfolders in server logging and Transfer Server cache. EN-83334	User color 'Grid Green' is not respected in InCopy. EN-83342	Sorting on PlaceOn and PlacedOnPage does not work as documented. EN-83352	Auto-detect obsoleted/deprecated PHP 5.4 and PHP 5.5 functions. EN-83420	Update the ionCube Loader wizard to support 4.6.1. EN-83469	Page range is incorrect with objects assigned to different Editions. EN-83550 Error when extracting Enterprise ZIP file on Windows. EN-83566	Multi-byte error is displayed for Enterprise installed on Windows with ionCube Loader 4.6.1. EN-83585	Server Job "Enterprise Event" should be inactive by default. EN-83628	[MadeToPrint] Changing states for multiple properties does not trigger MadeToPrint in Content Station. EN-83661	As Brand Admin user, links to articles are copied when copying layout without 'Multiple Placement' access right. EN-83683	Solr: Schema.xml in CJK version contains the stored="false" parameter instead of stored="true". EN-83684	Excel files are deleted in Enterprise after unlinking them from layout. EN-83692	Dialog Setup: Publication order does not match the configured order. EN-83698	Planned Page Range is shown for deleted layout in Smart Connection panel. EN-83773	Incorrect search results if 'Publish in' is used in 'Query Result Columns'. EN-83810	The 'deleted' and 'deletor' fields are not emptied when an object is restored from the Trash Can. EN-83840 Dialogs show unaccessible Workflow Statuses. EN-83880	DPS Issue out of sync because of 'Access denied' error. EN-84096	Named query with single quotes is not possible. EN-84259	The title basic property should not be mandatory but can be omitted. EN-84275	Support options_buttons for taxonomy fields. WordPress: Slideshows published to WordPress using Content Station 9.5.0 and Enterprise 9.5.0 are not working. No new features have been introduced in Enterprise Server 9.4.10 build 272. No changes have been implemented in Enterprise Server 9.4.10 build 272. No documentation changes have been made for Enterprise Server 9.4.10 build 272. EN-87196 Health Check Database Connection test shows OK even though database is not defined. EN-87409 Expose GetDialog >Dossiers property in the GetDialog2 connector. EN-87427 Adjust the download link for ionCube Loaders. The download files for this version of Enterprise Server can be found in the announcement. No new features have been introduced in Enterprise Server 9.4.9 build 261. The Elvis Content Source plug-in for connecting Enterprise Server with Elvis Server is now part of Enterprise Server and as such will be part of each Enterprise Server release. The reason for this is because of encryption that is applied to specific files of the plug-in; this encryption takes place during the building process of Enterprise Server files. Download links to the plug-in will be made available on the software download pages for Enterprise Server and Elvis Server. When integrating Elvis with Enterprise Server, the configuration now needs to be tested by running a test on the Enterprise Server Health Check page. In line with the recent changes made by Adobe, all references to 'Adobe DPS 2015' in the Enterprise Server software and in the documentation has been changed to 'Adobe AEM'. All references to 'Adobe DPS (2015)' have been changed to 'Adobe AEM'. EN-86110	Show EnterpriseID in wwinfo.php. EN-86695	WWTest Health Check page is empty when no database connection exists. EN-86855	SGLPlus plugin error in server logging on Oracle. No new features have been introduced in Enterprise Server 9.4.8 build 243. No changes have been implemented in Enterprise Server 9.4.8 build 243. No documentation changes have been made for Enterprise Server 9.4.8 build 243. EN-19143	FolderUtils.php uses inefficient and erroneous directory existence checking. EN-86509	Curl with HTTPS URL to run InDesignServerBackGroundJobs fails. EN-86352	Track Change in article results in line-break on Drupal 7. No new features have been introduced in Enterprise Server 9.4.7 build 211. No changes have been introduced in Enterprise Server 9.4.7 build 211. No changes to the documentation have been made for Enterprise Server 9.4.7 build 211. EN-85377	Incorrect number of parameters for function processResultRows. EN-86030	After changing the display name for metadata "Name", upload of an image from Content Station fails because of incorrect MaxLength. EN-86108	Export to PDF with large number of pages fails. EN-86324	When publishing to Drupal, regular text is displayed as Bold. EN-86247	Enterprise 9.4.6 database upgrade script breaks planning integration by removing adverts from layouts. No new features have been introduced in Enterprise Server 9.4.6 build 199. No changes have been introduced in Enterprise Server 9.4.6 build 199. No documentation changes have been made for Enterprise Server 9.4.6 build 199. EN-18998	Creating a new object fails in case 'ID' has a custom display name. EN-34213	Comments in componentDefs.xml are not clear to which Editor settings apply. EN-35055	Move FIRST_DAY_OF_WEEK option to its own section in configserver.php. EN-36880	Errors in logs are generated when importing content types from WordPress. EN-85679	Database error appear on preview using text with full length (255 characters) in plain-text field. EN-85685	In Planning Tab the default way to open an article template depends on the sorting order. EN-85687	Failed registration leads to blank page in Facebook registration page. EN-85689	Permission error during publishing to Facebook. EN-85826	Cleanup the smart_placements and smart_placementtiles table by eliminating duplicates. EN-85849	Issues missing during Solr indexing. The fix for EN-85849 "Issues missing during Solr indexing" will only take effect after re-indexing Solr. Re-indexing Solr is a long running process and should not be done during production hours. Cleaning up unused Publish Form properties for Drupal 7 from Enterprise Server 9. EN-85338. The legacy Open Calais will be discontinued on 31 August 2015 and is to be replaced by a new and improved Thomson Reuters Open Calais. This new version is not fully backward compatible with the legacy Open Calais and will require a few manual changes, a new API key and the OpenCalais plug-in of Enterprise Server 9.4.5 or higher. For information about upgrading from the legacy Open Calais to the new Thomson Reuters Open Calais, visit the Upgrade page on opencalais.com. For information about setting up Open Calais in Enterprise, see Setting up the auto-suggestion feature for adding tags in Enterprise 9. EN-85634	No InDesign Server preview in the Multi-Channel Text Editor with article from template. EN-85581	Solr search results in problems for Dossier. EN-85534	1(0).000's of records in Smart_Placement(Tiles) table. EN-85495	Drupal form import in production database takes hours. EN-85311	Undefined index 'editionname' error in the logging. No new features have been introduced in Enterprise Server 9.4.4 build 170. No changes have been implemented in Enterprise Server 9.4.4 build 170. No documentation changes have been made for Enterprise Server 9.4.4 build 170. EN-36880	Errors in logs get generated when importing content type of WordPress. EN-83860	Content Station CS4 Article Conversion does not work on InDesign Server CS6 and Content Station 9.4. EN-84670	Article status and type icon color change in Smart Connection panel when deleting a placed article from layout. EN-84829	Function header BizPageInfo::getPages doesn't reflect its description. EN-84842	Featured Image's description is not reflected in WordPress. EN-84880	Importing WordPress results in error "- C_WORDPRESS_FEATURED_IMAGE_FILE is too long". EN-84882	Migration from database v7 to v9 in MSSQL causes not up-to-date indexes in smart_channeldata table. EN-84968	Expose GetDialog->GetStatesResponse in the GetDialog2 connector. EN-84984	Drupal form import in production database takes hours. EN-85035	Modify ContentStationOverruleCompatibility_WflLogOn to list only FeatureAccessList that belongs to the overruled Issue. EN-85049	Vulnerability of Enterprise Server from Maintenance page. EN-85095	Content Station Views corrupted when asset have no Issue(s) assigned. Smart Connection views raise a SOAP error. EN-85113	Content Station changes images name when uploading to Dossier. EN-85116	Objects in Overruled Issue not visible for user without admin rights. EN-85248	No InDesign Server previews shown in Content Station when layout name contains special (accented) characters, shows (incorrect) error "layout not saved". EN-85287	Deletion of an Issue when the Issue has many objects assigned to it causes time out. No new features have been added to Enterprise Server 9.4.3 build 147. Support for Adobe InDesign Server CC 2014. To enable this functionality the database needs to be updated. This can be done by running the 'Database Connection' test on the Health Check page. No changes to the documentation have been made for Enterprise Server 9.4.3 build 147. EN-84840	Database errors with specific query on MySQL 5.5. EN-84839 Dossier created via the Create Image dialog in InDesign is not assigned to the Issue where image is created. EN-84611	Slideshow for gallery in Wordpress is not working correctly. EN-84774	Resizing or moving a Sticky Note changes modification date. EN-84649	[Preview] Layout is retrieved although it is not changed. EN-84790	Support for InDesign Server CC 2014. Upgrade. For information about upgrading an existing installation of Enterprise Server, see Enterprise Server 9 minor upgrade. Note: When Adobe InDesign Server CC 2014 is used, support for it needs to be enabled by running the 'Database Connection' test on the Health Check page. No new features have been added to Enterprise Server 9.4.2 build 138. No new changes have been implemented in Enterprise Server 9.4.2 build 138. No changes to the documentation have been made for Enterprise Server 9.4.2 build 138. EN-83956 Logging fails on IP addresses with port numbers containing a colon. EN-83700 Auto routing does not work with "Send To" without showing "Route To" dialog. EN-84520 DPS issue out-of-sync because of 'Access denied' error. EN-34141 Removing custom metadata property from one Brand also removes it from other Brand. EN-84198 Deleted On field does not sort correctly in Trash Can with Solr enabled. EN-84167 Solr error when executing a search on Deleted On. EN-35795 Manually assigned deadline to the layout is not shown in InDesign. EN-84142 Custom search shows no results when using Previous Issue. EN-83308 Error related to "SQL syntax" occurs when refreshing Publication Overview. EN-35748 Restored published images cannot be published again. EN-84460 Incorrect number of licenses are activated when entering '0'. EN-84422 Route To property is cleared for multiple selected objects. EN-84503 Number of placed images are not shown when deleting an issue. 'No' means: the user is created by a content source (such as Elvis) but has not yet been assigned to a user group and therefore does not have access to any Brands. No new features have been introduced in Enterprise Server 9.4.1 build 113. EN-32241	Status Change from Made To Print are not broadcasted to clients. EN-32717	Changing Issues is not working correctly when setting Dossier properties. EN-32882	Show Log button on Health Check page opens up an empty window. EN-33839	[LDAP] User 'woodwing' is hard-coded as an exception. EN-33868	The WWTest checkInDesignServer check runs too quickly. EN-34207	User is unable to edit Issue metadata in Print channel when DPS plug-in is installed. EN-34404	A suffix is appended when creating a Task in a Issue where a Task already exists with the same name. EN-34891	Planned Page Range shown after deleting the layout. EN-35071	[Solr] Searching on certain multi-byte queries returns incorrect results. EN-35720	In table smart_publications, defaultchannelid is not set when creating a new Brand. EN-35864	[Planning Interface] "Orientation" missing in SmartEditorialPlan.wsdl | CreateLayouts. EN-36027	Error generated in the server logs when Custom Search criteria dialog appears in Content Station. EN-36057	Phantom article is created when creating an article with “New Dossier” using the same name as an existing Dossier. EN-36540	InDesign Server Host Name cannot be longer than 27 characters. EN-36567	'Issue' field remains blank in the e-mail generated when placed articles are routed. EN-36723	Default Proxy Port for DPS = 1080 instead of 8080. EN-83125	[Solr] If (Elvis) content source does not find shadow object non of the objects are indexed. EN-83334	User color 'Grid Green' is reset to default user color in InCopy. EN-83342	Sorting on PlaceOn and PlacedOnPage not working correctly. EN-83456	Facebook Integration plug-in fails in v9.4. EN-83559	New MadeToPrint updates are not working correctly. EN-83684	Excel files gets deleted in Enterprise after detaching it from a layout. EN-83702	Show Log button incorrectly shown on Health Check Page. EN-83559 New updates of MadeToPrint integration are not working correctly because call to MadeToPrintDispatcher::clearSentObject() was removed from Enterprise Server. Enterprise Server can now be connected to Enterprise Analytics so that reports on one or more Issues can be run. In order for Enterprise Analytics to obtain the relevant data, a connection needs to be established between Enterprise Server and Enterprise Analytics. This is done through the use of an Enterprise Server plug-in. Selection. In this phase, files are selected with the purpose of using them in one or more stories. Production. Here, files are used for creating a story of a publication. Completed. Work on the publication is completed. Archived. The publication is archived. When using Enterprise Analytics therefore, each Workflow Status needs to be assigned to a Workflow Phase. In other words: when an article has the 'Gathering' Status assigned, it is part of the 'Selection' Phase; when an article has the 'Review' Status assigned, it is part of the 'Production' Phase, and so on. Assigning a Workflow Status to a Workflow Phase is done on the Workflow Maintenance page. 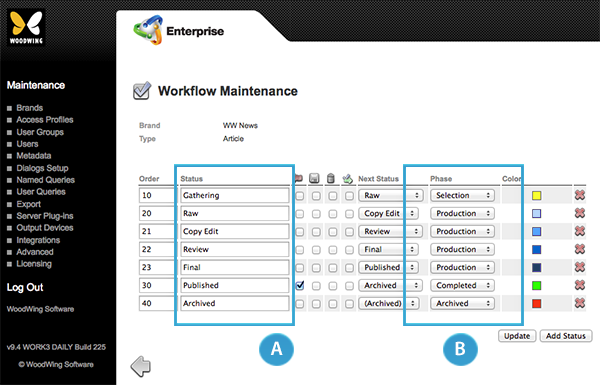 Figure: The Workflow Maintenance page showing the setup for the example mentioned above of Workflow Statuses (A) with their corresponding Workflow Phases (B) for an article. When a user takes up one or more license seats that actually need to be made available to other users, that user can now be forcefully logged out of Enterprise. This is done by selecting the instances on the Online Users page with which the user is logged in and subsequently clicking the Force Log Out button. Figure: The Online Users page now contains options to forcefully log users out of the system. Note: This feature will eventually replace the 'Remove Connections' option of the Licensing page. For more information, see Forcefully logging users out of Enterprise Server 9. When publishing a story to WordPress using Content Station, the published URL can be viewed by clicking the Properties button in the Dossier. This URL now shows the URL structure as defined on the Permalinks page (WordPress Settings > Permalinks). Figure: In this example, the Permalink settings in WordPress have been set up in such a way that the story title (A) is included in the WordPress URL for that story. This structure is now also reflected in the URL that is shown when clicking the Properties button (B) in the Dossier. For more information about Permalinks in WordPress, see the WordPress documentation: Using Permalinks. Users are now sorted by their full name. This makes it easier to locate instances of a user, for instance when forcefully logging users out of Enterprise. A column named 'Idle Time' has been added. This column indicates the time that has elapsed since the last activity was detected. This can help in identifying users who are logged in but have not been making use of the system for a long time. Such users can subsequently be forcefully logged out of Enterprise. The column named 'User Name' has been removed. This column was superfluous because of the column named 'Full Name'. Yes. Shown when the user information (full name, e-mail address and group names) is imported from LDAP. No. Shown when no user information is imported from LDAP yet. When making use of Enterprise Analytics, information about added, changed or removed objects are sent from the Enterprise Server to Enterprise Analytics. This is done through the use of scheduled Server Jobs. You will therefore see Server Jobs appear on the Enterprise Server Job Queue page that are used for this purpose. The FILE_TRANSFER_REMOTE_PATH setting which was intended for configuring the Transfer Server Folder was actually never used and has been removed from the configserver.php file. EN-20763	Admin needs possibility to force log-out a user. EN-23532	[LDAP] Active Directory User should not have the option to change passwords. EN-27830	Remove 'issue' column from query results. EN-31836	Warning "File does not exist for article" in server logs on updating article's geometry. EN-35870	Incorrect Editions assigned to layout in custom search. EN-36184	Named Query not returning proper results when logged on to version 9 server. EN-36601	Rating gets lost from article when checking-in all articles. EN-36631	Solr shows disabled Issues as '<niet toegewezen>' facets. EN-36742	The gallery folder of WordPress is not deleted when unpublishing a post. EN-36823	Remove un-used 'FILE_TRANSFER_REMOTE_PATH' option from configserver.php file. EN-36914	[MadeToPrint] Selecting > 1 object does not trigger generating xml/js files in MTP_SERVER_FOLDER_IN folder. EN-50670	Combined article preview required. EN-83071	Active Directory User is able to change his/her password through application. The Drupal 7 Maintenance page now allows you to import content types and taxonomies from either all Publication Channels or from a selected Publication Channel only, and to import only content types, only taxonomies, or both. The Access Right named 'Set Basic Formats' (part of the Typography group) now also controls whether or not a Content Station user is allowed to apply bold or italic formatting to selected text by using the Bold and Italic buttons in the toolbar or by using keyboard shortcuts. When the Access Right is disabled, the buttons will not appear in the toolbar. For information about Access Rights, see Access Rights in Enterprise 9. For information about making text bold or italic in Content Station 9, see Formatting text in bold or italic using Content Station 9. When previewing an article on Drupal 7 or WordPress from Content Station (by clicking the Preview button), a 'preview-' prefix is now added to the title. Adding this prefix makes sure that the URL of the actually published story can be kept the same as the story title without any unwanted post-fixes such as '_0'. On Windows 64-bit platforms, Ghostscript can be run as either a 32-bit application or a 64-bit application. See also Ghostscript integration in Enterprise Server 9. 26946	No auto-naming when same named object is uploaded multiple times. 32999	Long names for User, User Group and Access Profile make UI hard to use. 33952	Differences between creating images and articles before or after creating the layout and changiing the issue. 34296	Placed articles are not restored properly when Dossier is restored from Trash Can. 35505	The size of the user group panel is insufficient. 35812	Server Job type 'AdobeDps' cannot be created as a recurring job. 35960	[LDAP] Copying Activate Directory User corrupts Active Directory user. 35992	InDesign Server background jobs handling with Oracle does not work. 36002	Dutch translation error for 'days' and 'weeks'. 36013	Multiple articles with the same name allowed in the same Dossier. 36136	Add support for Ghostscript in 64-bit environment. 36153	First Dossier Notes missing in e-mail notification. 36220	User assigned to (Brand) Admin gains access to objects while profile does not permit this. 36221	User is able to route object to a deactivated user. 36282	Division by zero warning in log files. 36325	Current and Previous Issue not working properly in Custom Search with multiple Brands. 36341	Simple File System (SFS) plug-in is checking OUTPUTDIRECTORY instead of SFS_LOCALCONTENTFOLDER. 36538	Routed items do not appear in user's Inbox. 36618	No Jobs are submitted in InDesign Server background Jobs. The following new features have been introduced in Enterprise Server 9.2.1 build 60. For more information, see Supported Drupal fields for use in Publish Form templates. When using ImageMagick for generating image previews and image thumbnails, the IMAGE_MAGICK_OPTIONS setting in the configserver.php file can now be used to control the quality of these images. For more information, see Controlling the quality of ImageMagick previews and thumbnails in Enterprise Server 9. The Publish Form for publishing a story to WordPress now includes a component for setting a Featured Image. For more information about Featured Images, see WordPress Support. The Categories that are displayed in the Categories list in the WordPress Publish Form are now shown in a hierarchical fashion, similar to the way they are displayed in WordPress. This makes it clearer to which parent Category a child Category belongs. Each level is indicated by one or more dashes. Because of this implementation, the name of the Category in WordPress should not start with a dash (-) or a space. The following changes have been introduced in Enterprise Server 9.2.1 build 60. Support for the Date field in a Publish Form for publishing to Drupal has been changed so that the date on the Drupal Web site is displayed in the time zone that is configured for that Drupal site. Support for the Widget Type 'Text field' has been added for the Date fields, meaning that for Date fields the Widget Types 'Text field' and 'Select list' are now supported. The name of a WordPress Category can no longer start with a dash (-) or a space. This is because of the hierarchical way these Categories are now displayed in the Publish Form in Content Station. The content of the Enterprise 9 Admin Guide has now been fully transferred to the Online Help. As of the Enterprise 9.2.1 release therefore, the Admin Guide in PDF format has ceased to exist. 29810	Custom Search of Label returns no results. 30985	[DPS] Switching Edition when checking-in results in error msg DMEXPORT_COULD_NOT_EXPORT_NO_DEVICES. 32977	Change passing of parameters from GET to POST for DPS log-in. 34376	Not possible to license the system when database server is in different time zone then Application Server. 34702	Suppress warnings for duplicate key inserts for Enterprise 8.x. 35205	Unable to publish inline images when Drupal is set to 'Private local files served by Drupal'. 35340	Copy Dossier (template) to Dossier fails to copy Publish Form when print Issue is changed during copy. 35389	Edition is not reset if selected Issue for Export PDF is changed. 35445	Relative deadline can not be set to 0 in the Workflow Status maintenance page. 35463	Without any file access rights, the user sees full query results, provided that Solr is installed. 35466	ImageMagick previews are too dark. 35499	Custom metadata field is not assigned with type All; field name is displayed instead of display name. 35538	[DPS] Long filename assets can be left out of folio when exported or published. 35568	Admin from one Brand gets viewing rights on other Brand when using SOLR. 35575	Layout information/geometry not available for placed article when UseXMLGeometry is enabled. 35587	[DRUPAL] Add support for Drupal Field 'Date' (Unix Timestamp). 35755	Edition filter does not work in Export >Export PDF pages. 35769	[Planning Interface] Using HighRes | Brand,Publication Channel without Edition | Advert will not be shown on layout. 35823	[DPS] After receiving HTTP 500 error, Catalog on Adobe gets corrupted (double article(s)). 35826	[DPS] Setting parallel connections to 1 results in 500 error / max of 1 Dossier published. 35828	GetObjectsService ends session incorrectly when an exception is thrown. 35829	Status names are not displayed on the Deadline Maintenance page when the language of the user is changed to Russian. 35833	Current Publish Forms are not updated during upgrade. 35861	[WordPress] Only the first Category is exported. 35881	Unable to create Server Jobs when user language is Italian. 35894	[DPS] After receiving HTTP 500 error, Catalog on Adobe gets corrupted (double article(s)). 35920	WordPress Connector in Enterprise localized. 35955	Error 'Missing function parameter (S1000)' when saving new template created from template. 35958	Slow Solr indexing when updating Server. 36001	User language should be respected for column headers. 36045	Update Geometry is sent to InCopy when disabled in configserver.php. 36099	Leading zeros in page numbers cause wrong page order in the Publication Overview. The following new features have been introduced in Enterprise Server 9.2.0 build 46. Properties for multiple files can now be changed using a single Property dialog box instead of separate dialog boxes for each individual file. This way, users can easily change properties such as the rating or author. For more information, see Changing the properties of a file in Content Station. Simultaneously changing file properties in Content Station requires Solr 4.5 to be installed. For more information, see Integrating Solr 4.5 in Enterprise Server 9 and Upgrading Solr to Solr 4.5. SOLR_CORE. For defining the Solr collection. For more information, see Configuring Solr. SOLR_TIMEOUT. Controls the time-out period for Solr. For more information, see Changing the time-out period for Solr 4.5. Support has been added for publishing posts to WordPress through the introduction of a new Enterprise Server plug-in named 'WordPress Publishing Connector'. For more information, see Integrating WordPress in Enterprise Server 9 and Publishing to WordPress. Enterprise Server is now also compatible with InDesign CC Server. The LDAP configuration in configserver.php has been expanded with the option to map the full name to the given name and the surname. For more information, see Integrating LDAP in Enterprise Server 9. When already making use of Solr, an upgrade to Solr 4.5.1 or higher is required. For details, see Upgrading Solr to Solr 4.5. 35765 InDesign: Unable to "Create Article" from a layout that is in an 'Overrule Issue' Publication. 35672 Error occurs when dragging alien object from Elvis application to a Dossier with an overruled Issue. 35807 Invalid Status occurs when user tries to create a layout in an overruled Issue. 35821 Deadline is not calculated as per the deadline of "Category" and "Status". 35816 [MSSQL 2008R2] No deadline is displayed for an object created in an Overrule Brand. 35684 Deadline is not displayed for the Publish Form. The following changes have been introduced in Enterprise Server 9.2.0 build 46. The 'Refresh' option has been removed from the Dialog Setup page; this option was added in preparation for future use by the client applications and will be added again as soon as the feature is implemented in these applications. The use of relative deadlines is now disabled by default. The reason is that in previous versions the system required multiple database queries to find out whether or not deadlines are used, thereby negatively affecting system performance. In Enterprise Server 9.2, this check is now done through a simple check box on the Brand Maintenance page named 'Activate Relative Deadlines'. This check box is cleared by default and needs to be selected when deadlines are to be used. For more information, see for example Creating a Brand. Note: When migrating from a previous version in which deadlines are configured, the relative deadline mode is automatically enabled. In order to support the dark interface of InDesign CC and InCopy CC, as well as a need to support Smart Connection on Macintosh retina screens, new icons have been introduced. Not only are many icons now available in various resolutions, the majority have also been redesigned. A new folder named 'vendor' has been added to the main 'server' folder. It is used for storing 3rd-party libraries. Plug-ins that implement the WflSetObjectProperties connector have to also implement the WflMultisetObjectProperties connector for that plug-in, additionally any plug-in that implements the WflMultiSetObjectProperties connector but does not implement the WflSetObjectProperties connector will result in an error being thrown by the ServerPlugins health test prompting the user to update the plug-in to include the missing connector. 35765 InDesign: Not able to "Create Article" from layout in Overrule Issue Publication. The following new features have been introduced in Enterprise Server 9.1.1 build 42. PublicationOverviewMaxGridViewZoom. Limits the maximum zoom level. By matching it to the maximum thumbnail size, page previews are prevented from being loaded. This behavior can be manually overruled by selecting or clearing a check box in a dialog box when saving the layout, or it can be overruled through a custom Server plug-in. For more information, see Overruling the folio creation behavior of Smart Connection. When LDAP creates a new user account in Enterprise Server, the option of whether or not the user should be sent email notifications each time a file is routed to the user or the user group that the user belongs to is now also set. This is controlled by the newly introduced EMAIL_NOTIFICATIONS option in the LDAP section of the configserver.php file. For more information, see that file. Note: The Enterprise 9 Admin Guide has also been updated, although it does not contain any information specific to Enterprise 9.1.1. For the latest version, see Enterprise 9 Admin Guide. 30110	Implement an option to have Email Notifications set to true or false for LDAP users. 34362	Error occurs when attempting to move a Dossier to a different Issue. 34420	MadeToPrint problem with Enterprise-Elvis integration. 34432	wwinfo.php reveals admin passwords without the need to authenticate. 34451	Trying to upgrade a 3GB database in a Windows environment will error out due to memory constraints. 34511	[SOLR] Custom metadata of type 'datetime' fail to index (S1061). 34514	Licenses are removed when an incorrect serial number is used. 34529	Saving an object in a file store with insufficient disk space does not fail. 34571	Unable to extract metadata from image after metadata block embedded in XMP metadata of image. 34631	Files cannot be uploaded (CreateObjects/SaveObjects) to Enterprise Server using the JSON protocol. 34666	Database error appears when upgrading the Server from v7.0.11 to v9.0.0. 34888	Introduce Enterprise GUID to identify Enterprise Server. 35003	Add Server settings for large page thumbnails and limited zooming in Publication Overview. 35048	Attempt to run Elvis Server job results in a created Adobe DPS job. 35051	[Solr]: error while reindexing or when searching for newly created objects. 35274	Upgrade to version 9 fails because of call to undefined method. The following new features have been introduced in Enterprise Server 9.1.0 build 32. Support has been added for publishing posts to Facebook through the introduction of a new Enterprise Server plug-in named 'Facebook - Publish Forms'. For more information, see Facebook installation and configuration and Creating a story for publishing to Facebook. Support has been added for publishing posts to Twitter through the introduction of a new Enterprise Server plug-in named 'Twitter Publishing Connector'. For more information, see Twitter installation and configuration and Creating a story for publishing to Twitter. For more information, see Supported Drupal fields for use in Publish Form templates and Adding multiple files to a Web article. Automatically generated tags are provided by an external semantic service provider (by default the one from OpenCalais, see above), while the auto-complete feature is based on a list of tags (by default from Drupal). For more information see About adding tags to Web articles, Setting up the auto-complete feature for adding tags, Setting up the auto-suggestion feature for adding tags and Setting up a fixed list for adding tags. OpenCalais is an external Suggestion Provider, used in Enterprise for scanning the content of a Publish Form for articles aimed at publishing to the Web. After scanning the content, suggested tags (keywords) are generated which are subsequently displayed in the Publish Form in Content Station where the user can optionally include them in the article. For more information, see OpenCalais, About adding tags to Web articles and Setting up the auto-suggestion feature for adding tags. The Zend OPcache module (formerly known as Zend Optimizer+) provides faster PHP execution through opcode caching and optimization. It improves PHP performance by storing pre-compiled script bytecode in the shared memory. This eliminates the stages of reading code from the disk and compiling it on future access. In addition, it applies a few bytecode optimization patterns that make code execution faster. For more information, see Installing Zend OPcache and Clearing the Zend OPcache. Support for the Drupal content type field "Autocomplete term widget (tagging)"
The Drupal content type field "Autocomplete term widget (tagging)" is used in Publish Forms for displaying tags provided by a suggestion service, and for providing the auto-complete feature for adding tags. Such tags can be added in articles that are published to a Web site. For more information,see About adding tags to Web articles, Setting up the auto-complete feature for adding tags and Setting up the auto-suggestion feature for adding tags. When a Content Station user checks-in a file for which a preview is generated, Enterprise Server now generates a thumbnail in a size of 256x256 pixels instead of 100x100 pixels. A new slider in Content Station allows the user to change the size of the displayed thumbnail. Note: Thumbnails for layouts need to be generated by Smart Connection 8.3.3 or higher. For more information, see Changing the size of thumbnails. For more information, see the Enterprise v9 Message Specification. For general upgrade instructions, see Enterprise Server 9 minor upgrade. Step 1. In Drupal, click Modules in the menu bar. The List tab of the Modules page appears. Step 2. Disable the WoodWing Enterprise module. Step 3. Access the Uninstall tab of the Modules page and uninstall the module. Step 4. Replace the WoodWing Drupal module in your Drupal environment by the one that is provided with the Enterprise 9.1 release. Step 5. In Drupal, enable the WoodWing Enterprise module on the List tab of the Modules page. Step 6a. Access the Drupal 7 Maintenance page in Enterprise Server. Step 6b. Click Import to import the content types. The content types are imported and the result of the import action is displayed. The following changes have been introduced in Enterprise Server 9.1.0 build 32. Decimal Double If no minimum/maximum value is configured for the field, the minimum/maximum value will be determined automatically based on the precision and scale settings of the Drupal field. File File Selector Cardinality changed from "must be 1" to "may be any". This field can now be used for including multiple files. Float Double When no maximum or minimum values are configured for the field, these are now restricted by a maximum value. Image File Selector Cardinality changed from "must be 1" to "may be any". This field can now be used for including multiple images. Support for Alt text and title. Integer Integer When no maximum or minimum values are configured for the field, these are now restricted by a maximum value. Long text and summary (Plain text setting) Multiline The summary field is now supported. Note: The Enterprise 9 Admin Guide has also been updated, although it does not contain any information specific to Enterprise 9.1. For the latest version, see Enterprise 9 Admin Guide. Added icons for Drupal, Facebook and Twitter. Added references to Facebook and Twitter. Related feature: adding tags based on auto-complete or a list. Due to a known issue in Drupal 7, Enterprise can only import up to around 7000 Terms per vocabulary (Term Entity). 34994 Auto-complete terms containing a forward slash '/'-character are not working properly. 20845 Password check at login only checks the first 8 characters. 27116 Renaming a user group wipes Route To information. 33892 Default Publication Channel not created in new database. 33988	User password is not encrypted in log files. 34016	Group names and user names appear as blanks in Route To fields if they are changed. 34567	[Publish Form] S1120 error appears when importing content type containing a Summary field set as plain text. Free. (Requires Adobe DPS Release 26). Enables a user to preview the article for free. Metered. (Requires Adobe DPS Release 27). Enables a user to preview an article for free, but only as long as the total number of free articles that can be viewed for that publication has not been reached yet. Once that total is reached, the user is prompted to purchase the publication or a subscription. For more information see the Enterprise 9 Admin Guide, chapter 35, Digital Publishing Configuration – Step 5.2, Adding Custom Metadata. When importing a Drupal content type as a Publish Form template in Enterprise and subsequently changing the name field and/or the description field of the content type in Drupal, the Publish Form template is now correctly updated when re-importing the content type in Enterprise. A Drupal content type is created named "My Content Type". When clicking Import in Enterprise, the content type is imported as a Publish Form template named "My Content Type". In Drupal, the content type "My Content Type" is changed to "My New Content Type". When clicking Import in Enterprise, the changed content type is imported as a new Publish Form template named "My New Content Type" instead of updating the existing Publish Form Template "My Content Type". As a result, 2 Publish Form templates exist instead of 1. As a result, any Publish Forms based on the "My Content Type" template cannot be published or updated anymore because a content type with that name does not exist in Drupal. When clicking Import in Enterprise, the existing Publish Form Template "My Content Type" is updated to "My New Content Type". As a result, only 1 Publish Form template exists which is correct. Because the names in Enterprise and Drupal match, no issues arise when publishing or updating the content to Drupal. Note: When making use of Publish Forms in Enterprise 9.0.0, carefully read the Upgrade instructions: they contain important information. Use the regular upgrade instructions as provided in Enterprise Server 9 minor upgrade. The change in the way content types and Publish Form templates are mapped (see Support for re-importing Drupal content types with changed Name and/or Description fields) may or may not affect your upgrade process. No issues are expected when re-importing the content types: Enterprise will automatically change the mapping based on the matching names. Step 1. Upgrade Enterprise by using the regular upgrade instructions as provided in Enterprise Server 9 minor upgrade. Note: It is especially important to create a backup of Enterprise. Step 2a. Access the Drupal 7 Maintenance page in Enterprise Server. Step 2b. Click Import to import the content types. Step 1. In Drupal, change the name of the content type so that it matches the Publish Form template it is related to in Enterprise Server. Step 2. Upgrade Enterprise by using the regular upgrade instructions as provided in Enterprise Server 9 minor upgrade. When running the Health Check page as part of the upgrade steps, you will be prompted to import the Drupal content types. Online Help: Enterprise Server 9 minor upgrade. PDF: Enterprise 9 Admin Guide version 1.1.0. Chapter 35 Digital Publishing Configuration updated with Adobe DPS Free Article support. 32713 WW_TextConverters_Wcml2Xhtml stops converting when Track Changes is used. 32997 WWTest should report that UTF16 is supported for the National Character Set. 33031 [DPS] Content Station will show DPS Viewer Version '24' for an issue upgraded from 7.6.2 to 8.2.0. 33058 It is possible to delete a user that has an object locked and object remains locked. 33186 [MCE][IDS] Articles with long (>32) Cyrillic names result in error when previewing. 33288 [DPS] Exporting can cause memory consumption up to 3x the Folio size. 33539 Italian translations for Sticky Notes are incorrect. 33653 Extra test Brands created during Admin Interface test not removed. 33659 Objects are displayed in Smart Connection panel without any user authorization for an Issue. 33685 [Planning] Error when sorting on a metadata property. 33723 Name for DPS Server Job should be 'Adobe DPS' instead of 'AdobeDps'. 33742 Unable to add custom metadata property with same name in two different Brands. 33772 Unable to add custom metadata property with same name in two different Brands. 33975 [HTML Conversion] Article with Track Changes shows incorrect content in HTML after conversion. 33993 Changing status of Dossier with Send To removes DPS sorting. 34018 [DPS] The content type of the library and section cover is set to an 'unknown' MIME type. 34108 [HTML Conversion] Table cells in articles are missing styles when converted to HTML. The following issue has been fixed in Enterprise Server 9.0.0 build 14. 33644 - [DPS] Issue is only partly published when using the "Publish Selected Section" option in Content Station. Instability issues when importing Publish Forms from Drupal 7 to Enterprise on Windows/IIS/Oracle. Publish Forms allow Content Station users to quickly and easily prepare a story in order to publish it to a particular Publication Channel. This is done by showing the user only the information that is relevant for that Publication Channel. Currently, Publish Forms are only used for Publication Channels that are set up for publishing to a Drupal 7 based Web site. This also means that publishing to Publication Channels set up for print, Drupal 6 or Adobe DPS is still done by using the same method as for Enterprise 8. 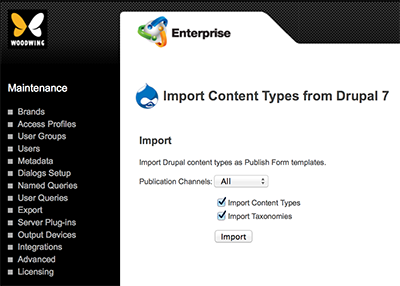 A new Maintenance page is introduced named "Import Content Types from Drupal 7". It is used for importing Drupal 7 content types in Enterprise for use as Publish Form templates. The page can be accessed by clicking Integrations > Drupal 7. The following changes have been introduced in Enterprise Server 9.0.0 build 12. The "Publish to Drupal" Server plug-in has been renamed to "Drupal 6". Starting with Enterprise 9, product documentation will be made available as online Web pages in HTML format instead of PDF files. The structure is set up in such a way that all information for a product will be available in one location. This applies to topics such as installation, configuration, using the software, and so on. Documentation such as an admin guide, user guide or scripting guide will therefore cease to exist: all information is available as separate topics in one location. We are currently still in the process of moving the documentation from the PDF format to the HTML format.While this is taking place, some or most information will still be made available in PDF format until all information is migrated to the Online Help. For all other topics, please refer to the Enterprise Server 9 Admin Guide in PDF format. The following issues have been fixed in Enterprise Server 9.0.0 build 12. 33026 [MTP] Status not updated after successful creation of PDF, MSSQL. 32897 Oracle errors when deleting user. 31091 Output renditions are not cleaned using version control settings. 33151 Deleting an object clears the values for a custom property. 31337 Database error message appears when using a long name in a STRING custom property and saving the object.